Priming's occupies a freestanding two-story corner building in SoBro (south of Broadway), the hottest up-and-coming neighborhood in one of the nation's hottest tourism cities. Chase Lyle never really enjoyed a cigar before his deployment to Iraq. But by the time the Marine Corps veteran returned to his native Nashville, he was a changed man—and bent on changing Music City's cigar scene. "We had a lot of cigars over there. I remember the first one I had was on Christmas Eve in Fallujah and it was snowing—no one ever believes that but it snows there. After I had a few I started to wonder why they were so different. Over there, everyone obsesses about something, and for me it became cigars. When I had free time I did online research, and I loved the history, even how the boxes are made. Then finally I got an issue of Cigar Aficionado, like two years old, the only one I could find over there, and there were these pictures of glitzy lounges. I was like, ‘There's nothing like that in Nashville, I'm doing that when I get back.'" Lyle is now in the Air National Guard, and today he is a serious tobacconist with an eye on customer service. Heavy duty, multiple ring-size tabletop cutters and cedar strips sit at every table, and from how to cut to how to light, staff here is very hands on in terms of assistance. When a customer describes a style of cigar they like, Lyle encourages his staff to pull three similar selections, present them on a tray and explain the unique differences of each. "I visited a lot of other lounges when we were planning and there's often a feeling of intimidation. Our mission is to educate and I'm still amazed how many people ask if it's okay to go into the humidor. Yes it is, and we don't hover over them." The downstairs is open to the public, with comfortable leather chairs and couches around low coffee tables, and an intimate loft seating area. Priming's is named for the style of harvesting common to most tobacco plants, and occupies a freestanding two-story corner building in SoBro (south of Broadway) the hottest up-and-coming neighborhood in one of the nation's hottest tourism cities. It's a five-minute walk from the Omni Hotel, Convention Center and Country Music Hall of Fame complex in the heart of downtown, and several new hotels are being erected around it right now. It took Lyle three years to locate the space of his dreams, a 120-year-old building with exposed brick walls, and in the private club upstairs, original pressed tin ceilings. "I knew what I wanted: it had to have a separate private entrance for a member's area, parking, and the feel of an old Southern gentleman's club. 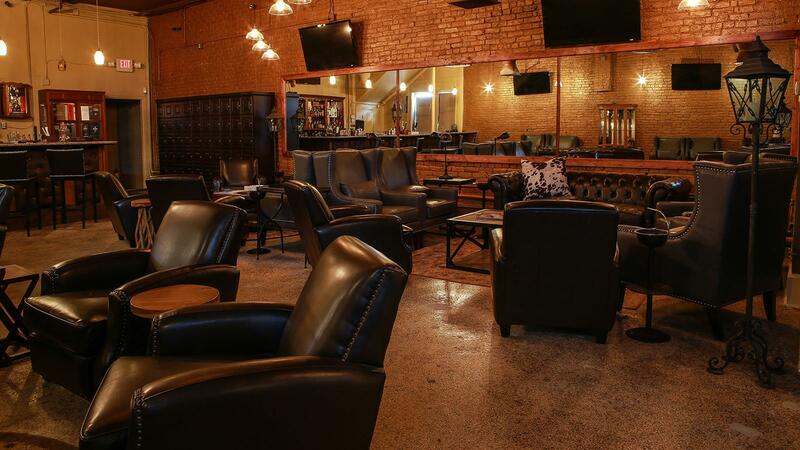 I wanted it to be known as Nashville's high-end cigar bar, but affordable to anyone." He is currently in the process of adding a 50-seat outdoor deck. The downstairs is open to the public, with comfortable leather chairs and couches around low coffee tables, and an intimate loft seating area also open to anyone on the way to the members club upstairs. There are a few televisions with games on, but Priming's is more golf clubhouse than sports bar in feel, and Lyle went overboard on ventilation, because he gets a lot of non-smoking cocktail customers and didn't want to see, let alone smell, smoke. "I took whatever they recommended for the cubic feet of each space and doubled it." In the back of the main floor is a classic bar and being Tennessee, there's a Bourbon and Southern whisky focus, and a menu specializing in Prohibition era classics. There is also a list of smoked cocktails (using pipe tobacco and a culinary smoking gun). Bar food is simple, meant as snacks rather than meals, including paninis, antipasti and charcuterie plates, but it skews gourmet, all made in house from scratch and well curated ingredients. Displayed prominently in the front is the glass walled walk-in humidor, stocked with just over 300 options (Lyle keeps expanding, with a goal of 600), including all the big names. But surprisingly the best seller is the limited-edition Aviator line from Principle Cigars, a company owned by a fellow Nashvillian, and Lyle claims his is just one of two spots in the country that also carries Principle's made-for-Europe lineup. Other niche specialties include an impressively broad selection of boutique Sans Pareil cigars, while his other top sellers after Principle include Rocky Patel and Aladino. Monday-Thursday 12 p.m. to 11 p.m.
Friday- Saturday 12 p.m to 1:00 a.m.
Sunday 11 a.m. to 9 p.m.